It's been a while since we've heard rumors of the mythical creature known as the Surface Phone, but if the rumor mill is to be trusted, a number of huge details about it (like, for example, that it hasn't been shelved like most of us suspected) may have just been revealed by Microsoft itself. As far as obscurity goes, the source of the information probably ranks pretty high on your average Westerner's list – a video description on Microsoft's official account on Bilibili, a Chinese, anime-themed YouTube-like video sharing service. The text reveals a couple of very interesting details, to say the least. First off, the name: at least in China, the device won't be called the Surface Phone, but rather the Surface Mobile. The Surface Mobile is said to include built-in, "onto table" projection capabilities in Continuum mode. That is, you'll be able to use a regular Tdesktop interface wherever you go, no monitor required (for about an hour). For those of you who are unaware, Continuum was one of the first major implementations of the desktop-on-a-smartphone idea (last seen with Samsung's DeX Station), and essentially looks and acts like a regular Windows 10 desktop (but only supporting UWP apps). The Surface mobile will also include some sort of stand or base, which will be able to lean up to 185 degrees. There's two possible reasons for this inclusion: firstly, to project something onto a surface, one needs to keep their phone upright somehow; and secondly, to make it fit alongside its siblings in the Surface family. The projection feature is said to be usable for only about an hour, unfortunately. This is somewhat logical, though: we imagine such a feature produces an excessive amount of heat which, in extreme conditions, can damage a phone. Plus, battery life could potentially be a major concern as well – but we still don't know any specifics, so all we have is speculation for now. But possibly the biggest feature people have been asking for in a Microsoft phone might finally come with the Surface Mobile: Surface Pen support. And what's even better, this will be a model specially designed for the device, with one translation of the description saying the Surface Mobile will come equipped with it. So a Galaxy Note-style pen tray? We hope so. And on the software side, the Surface Pen will be able to easily call out OneNote with a single tap on the device's display, which should be extremely convenient for taking instant notes on the fly. Here we have some good and some bad news. What's good is that the Surface Mobile will be powered by a Snapdragon SoC, providing "a perfect balance between performance and power consumption." The bad news is that this exact line sounds suspiciously like Microsoft justifying putting a mid-range processor into its flagship. So we expect to see a 6xx-line chip inside, which will hopefully be the recently-unveiled 660, whose benchmarks show a lot of potential. On the other hand, we've also heard rumors of a Snapdragon 835-equipped Surface Phone, so nothing is for sure. However, let's take a moment to look at a couple of Microsoft patents from a few months ago, which show a foldable, two-display device which perfectly fits the bill for the Surface Mobile and its mysterious hinge. 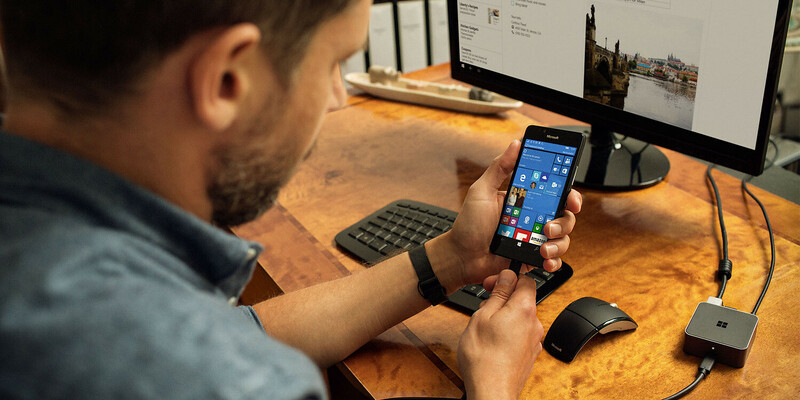 This is Microsoft we're talking about, which means the device will absolutely run some version of Windows 10 Mobile. But here's where things get interesting: the text heavily alludes to support of regular, Win32 applications (or .exe programs, if you will). This is a major change for the platform, which has thus far only supported Universal Windows Platform apps on mobile instead. Whether support for them will be limited to Continuum mode is unclear, but the implications are exciting nevertheless. Lastly, the description ends with a mention of two things called "Surface peking [sic]" and "Surface Slavonia." These most definitely do not sound like features, though: instead, they are most likely the names, or at least the code names, of two separate Surface Mobile handsets (Peking and Slavonia are both real-life locations, and companies just love naming products after such things). This could also explain why a specific SoC wasn't mentioned: perhaps the two different models could sport different internals. So, overall this leak seems pretty legitimate: while the video itself was deleted, a cached version of its page can still be found online, proving it came directly from Microsoft itself. And judging by what we're seeing here (which, unfortunately, doesn't include any photos), Microsoft isn't betting on the mainstream anymore, but instead hopes to capture an audience with people who really love the idea of a hybrid desktop/smartphone. Whether this will work remains to be seen (though Microsoft's previous efforts don't give us that much hope), but we still have a lot to find out about the device as well, including actual hardware specs, design, and price. Plus, Microsoft is no stranger to giving up on innovative ideas at the last moment, so there's a distinct possibility that the Surface Mobile might never actually make it to the market. Please dont be a size of a tablet. If only this will become a reality, i wouldn't even be considering the iphone 8 and v30. You got to keep it real! Till now I still don't understand why Microsoft treat their latest Windows 10 mobile like an orphan. In the beginning, yes Windows 10 mobile is buggy and release in a premature form but now that its stable why they withdraw their support. I am sure if they introduce another round of budget and flagship phones their sales and return rate would be much better. In the meantime, I do enjoy my Windows 10 mobile phone despite its disadvantage created by Microsoft. If they pull on removable back-casing like the LG V20. Otherwise, I would like them to maintain the design language of the Surface family. I don't want them to build a plastic phone, because it would immediately get shunned by the consumer base and ridiculed by the harebrained tech "journalism" base. Looking at the Microsoft Northstar concept, I don't think they are looking forward to building a plastic phone either. Personally, I am a fan of removable batteries. Looks like that question got answered pretty quickly. Ah! Windows Mobile, eh? No matter how many times it turns into dust and ash; Microsoft never fail to breathe new life into the OS... And it rises from the ashes; Like a... Phoenix...! Only to be turned into dust and ash again... But I'm sure glad that cycle continues to spin...! Here's a supposedly 'leaked' version of the upcoming major update of Windows 10 Mobile; 'dubbed' the CShell and just look how many features it puts on the table...! Courtesy of Windows Central on Youtube:https://www.youtube.com/watch?v=YNxtMtlrm6U Impressive indeed... Even though Microsoft has sacked thousands of employees working on W10M last year, the OS continues to flourish, as evident from this video... Oh well, G'Day! They just develop hardware for them to have a software to build unto. Then patent it. After 5-10 years when the tech is niche and relevant, profits. Big example? Android and iOS. That's why they never really care about devices or hardware. Software is Microsoft's real game. omg...this silver Galaxy Note 7 is hot!!! This will surely hurt my pocket. But it's worth it. Why don't they drop the Surface name? I don't recall any successful product associated to it (surface pros are okay, but not market juggernauts). The Surface line has redefined the 2 in 1 category. What are you smoking? Puff puff pass. Haha I got a surface book too! It's awesome! Shake paws! This will not be mainstream, but will cater to a small number of users only. I hope though it becomes successful. It better impress right out of the gate - if they can't get it right on the third try they should abandon mobile permanently. Now AMD will release a ryzen mobile and we will be able to run x64 apps on windows based phone. If Intel haven't stopped atom evolution today surface phone would had a different future. They could also include an android runtime for been able to run apps like bb passport. Why would anyone want to run apps limited to Jelly Bean 4.3? IF Microsoft was smart they would figure out someway to offer android app support and solve the biggest issue with the platform. I'd gladly buy a Surface phone with x86 and Android app support and never look back at iOS or Android for a phone. If it works like it would on a native android device then I'd be ok with that.